MDB Password Recovery Tool helps you to make any password protected access database file accessible. It allows you to open password protected MDB database with Access Password Unlocker. It will help you to remove the lost or forgotten ACCDB database password. MS Access MDB Password Recovery tool does not make any changes to the existing file password. With the help of ACCDB Password Recovery software, it is possible to remove any type of password created by the users. This tool can retrieve multilingual passwords, passwords composed of special characters, numbers or even numeric passwords. 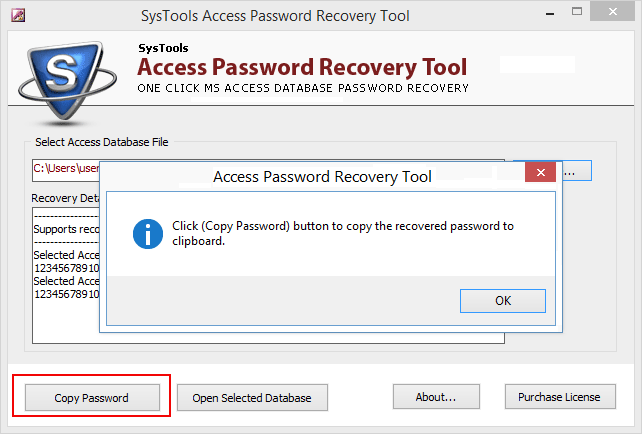 You can recover access database password in original format. As you add MDB file, the Access Password Recovery tool scans the whole file. 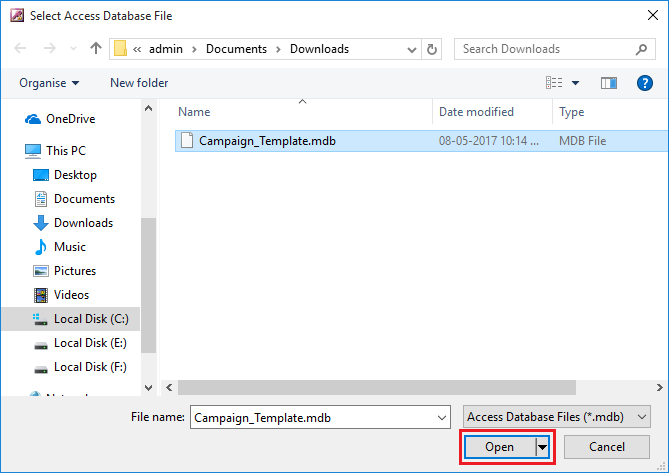 These details include information of Access database which is created in Access 95 or 97 and recovered Access database password of MDB files. 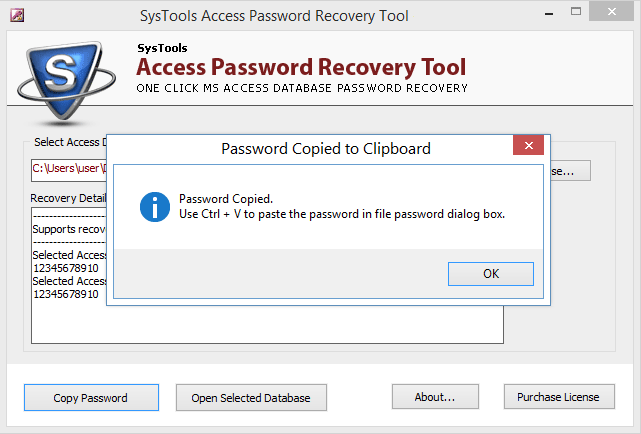 When the Access database password removal process finishes, then a user can copy the password using copy button and open the document using recovered access password. Entire commands section and options to unlock MDB file password are integrated on a single panel of the Access Password Remover. This tool makes it easier for a user to operate it. The user is not required to switch between panels to recover ACCDB file password which avoids unnecessary confusion. The password protected MDB file can be unlocked using this tool without any compatibility issue. 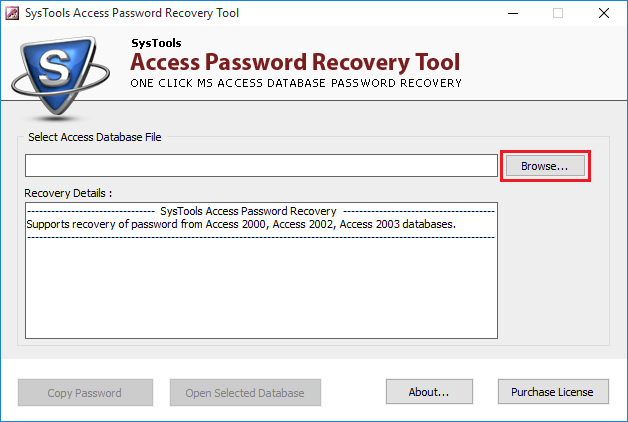 If by chance the password was created of alphanumeric characters, then also this Access Password Recovery software is capable to restore MDB database password. ACCDB Password Recovery tool can support MS Access 95, 97, 2000, 2002 and 2003 database password. This software helps to remove password from ACCDB file from any version of MS Access in three simple steps: Add > Scan > Copy Password. Hard disk space : 3 MB of free hard disk space required. The trial version of MDB Password Recovery tool allows you to recover only first two characters of password. Is this MDB Password Remover helpful in unlocking backbreaker passwords from MDB file? Yes, this Access Password Recovery Software is programmed to remove any type of complex password from MDB file in countable minutes. Does this software unlock Alphanumeric password of Access database file? 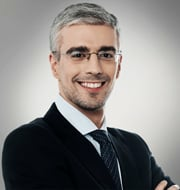 The MDB Password Recovery tool is capable of unlocking the complex password generated by the strong password generator. Whether the password is the combination of alphabets, numbers or symbols Access Password Remover can unlock database file efficiently despite complex password. Can I reset the password of Access database file? No, you cannot reset the password using this software. It is Access MDB Password Unlocker tool and allows you to only recover password from Access database file. You can remove password from ACCDB/MDB file and can set the password later. Is this tool helpful to recover corrupted Access database file too? 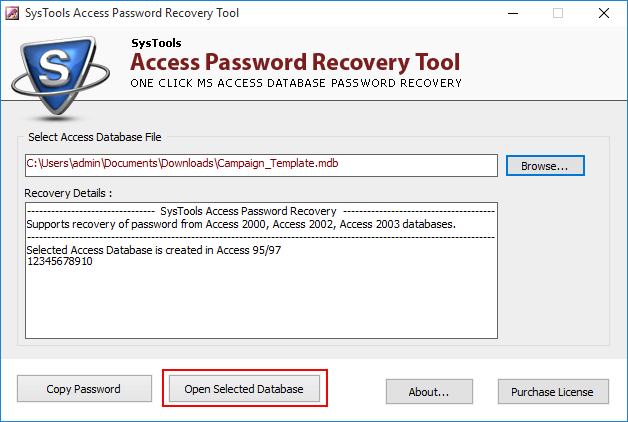 No, this MDB Password Recovery Software only allows you to remove password from Microsoft Access Database files only. If you want to recover corrupted MDB/ACCDB files then you can use our Access Recovery tool. Can I remove password from MAC OS based MDB files.? Yes, you can recover Access database password of MAC OS based files. What you need to do is to install this ACCDB Password Recovery Software on your Windows system. Is there any chance of data loss while removing Access database password? No, MDB password unlocker only recover password of Access database file without losing any data. Can I use this software in Windows Vista? Yes, you can use this ACCDB Password Recovery tool on all Windows OS such as Windows 10, 8.1, 8, 7 and all below versions. Is is necessary to install Access database to remove password from it? Yes, the MDB Password Recovery tool requires the installation of MS Access Database. If Access Password Remover is installed then the utility can easily recover ACCDB/MDB file password. I had updated my old Access database password with the new password and then I forgot both my passwords. Will this ACCDB Password Recovery tool be able to recover both my passwords? No, MS Access Password Remover only unlocks the latest updated password and you can later reset or remove your MDB password. I created a college project using MS Access database and saved password in the alphanumeric form. Unfortunately, I forgot my password and the project evaluation was round the corner. 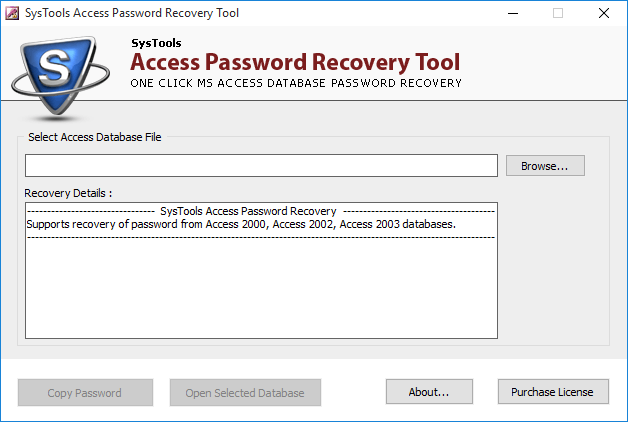 I searched for a lot of MDB Password Recovery tools and found this software as best one to recover access database password. I am very happy and satisfied with this ACCDB Password Remover. 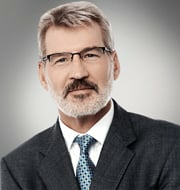 Big thanks to the development team. You guys are genius and supportive. 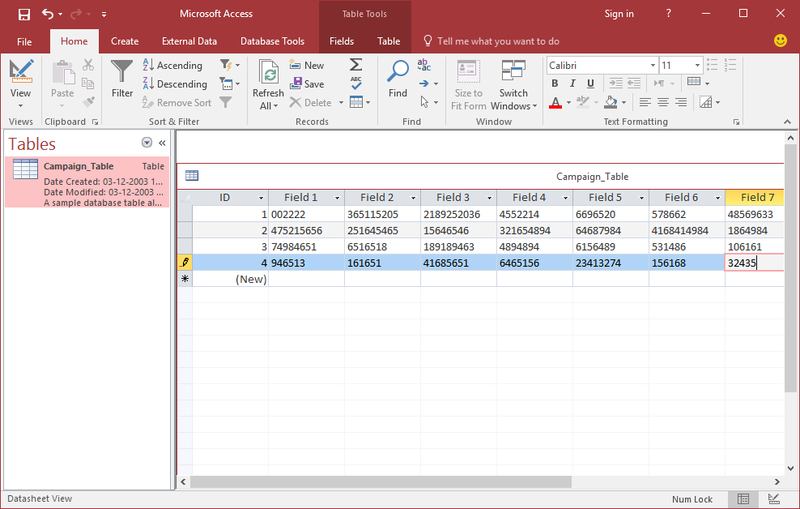 The support team helped me to remove password from Microsoft Access Database. I was searching for a tool exactly like this one and after so much research I got this MDB Password Recovery tool. This software helped me to remove password from ACCDB and MDB file both that too so easily. I didn’t lose any data during the whole recovery process. Last month when I logged in to open my Access database, I was shocked to see that my password was not working. Then one of my friends suggested me this ACCDB Password Recovery software and I recovered my password by following just three simple steps. Step 8: The tables and database are shown of the password protected file.